As small as the country might be, The Netherlands is one of the top 5 producers of food in the world, and the second largest agricultural exporter after USA. The reason is that since long, the Netherlands has had focus on technology driven farming, trying to optimize the production facilities available. 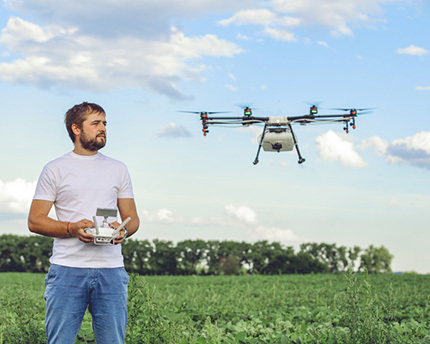 There is an increased focus on the use of technology in the Dutch agricultural industry that provides opportunities for Finnish tech companies specialized in the smart farming domain. Due to mergers, economies of scale and funded discontinuation, the farming landscape will evolve and decrease in number of participants, but grow in number of output. For example, the number of cattle farmers will decrease from 17.000 to 12.000 by 2020. Initiatives to increase the sustainability of the Dutch farming are supported by for example supermarkets to ensure investments along the whole value chain. The demand for food on the world arena will increase dramatically, with less capacity to produce due to climate change. To meet demand, technical innovation is key. In Holland, also near-shoring (producing close to the demand) and eco-friendly products are becoming vital areas of development, together with precision farming. Co - creation, involving consumers in the product for example with recent developments about poultry farming (source: ABN-AMRO industry report) In the Dutch Top Sector Program, Agriculture plays a dominant role. Government, branch organizations, universities and banks are working together to shape the future of farming in the Netherlands. With sustainable scaling, agro-technical investments and smarter food processing, farming becomes increasingly efficient throughout the whole chain from farm to food. The Netherlands does not just produce tomatoes, it also strives to maintain its forerunning position in agricultural knowledge. Though 80% of all the glass greenhouses outside Europe are coming from the Netherlands, yet only very few players are already active in vertical farming or chamber farming solutions. The startup of the year in 2016 produced a “Fitbit for cows”, to measure the vitality of cattle life-stock. The Dutch just released a governmental plan to attack food waste, with focus on tackling the 30% of food waste every year. Also the agricultural waste will be in the future even more efficiently used for example for raw material for packing industry. The Dutch government, together with private partners invests 40 million in Agricultural innovation in the Netherlands (announced Dec 2016). Goal is to support efficient agriculture, robotized agriculture and data driven agriculture. There is also budget for smart greenhouses, light and reflective materials to further improve the efficiency of greenhouses. Vertical Farming: Dutch organizations are exploring the possibilities of vertical farming in urban environments as well as industrial greenhouses. TradeMill has a network with extensive experience in the agricultural sector, working with technology innovations from Finland into the Dutch Agricultural sector. Contact Petra Wullings for a chat about the Smart Farming Industry in the Netherlands, we are more than happy to help you! Keep posted about the business opportunity news in The Netherlands and receive all updated Fact Sheets in your mailbox.